A mature avocado tree shades the hardscaped patio located just outside the great room of a Los Feliz renovation. 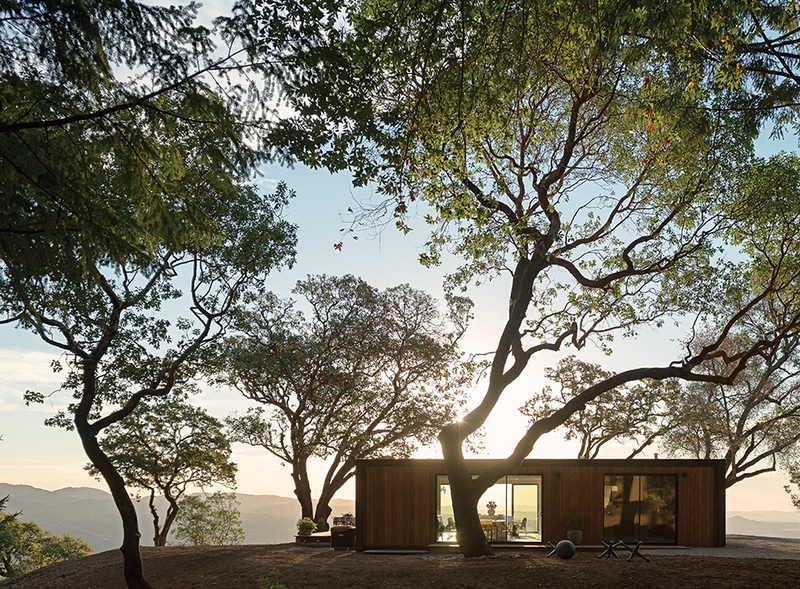 Mark Word Design did the landscaping, with an emphasis on water conservation, surrounding this Austin, Texas, house by Alterstudio Architecture. "It's about usage levels, but it's also about the way we treat storm water and runoff since it all goes back into our supply at the end of the cycle," designer Sarah Carr says. Word and his team chose plants that help reduce erosion, require little watering, and allow storm water to percolate. Mulch and living ground covers—including Big Blue liriope, marsilea, and Palisades zoysia turf—keep moisture within the soil and lower the temperature of the soil, protecting the roots of the live oak trees. In the gravel-lined entry court shaded by a Japanese maple tree, furniture from Beall and Bell—an antique shop in Greenport, New York—mixes with Pendant Globes by Primelite Manufacturing. Bobo pillows by Adler outfit the banquette, and cedar clads the interior of the seating area. Architect Andrew Heid created this long-term home for his parents around a glass enclosure built to celebrate the greenery of its Northwestern site. “Because you have this incredible proximity and connection to the outside, you have a higher aesthetic awareness,” he says. Claire and Ken Stevens approached architect Ko Wibowo to create a modern addition to their 1970s home in Tacoma, Washington. Originally designed by architect L. Jane Hastings, the house is located on a steeply sloped site that backs up to a state park.